every time i visit my parents i turn back into a kid again. must be the fact i'm sleeping in my old room, mom bakes bread and cakes and everything smells so nice in the morning and we all sit together watching tv and end up dozing off. this weekend, just like old times, me and my sister went through our mom's closet trying on her dresses and shoes. we would always play dress up when we were kids while our parents were at work. but this time around, the dresses my mom wore back then actually fit us. she really has some amazing dresses, most of them custom made at the tailor's with specific instructions she gave. the truth is, back when she was young you didn't have much choice but make your own clothes if you could sew, or have them made at the tailor's. 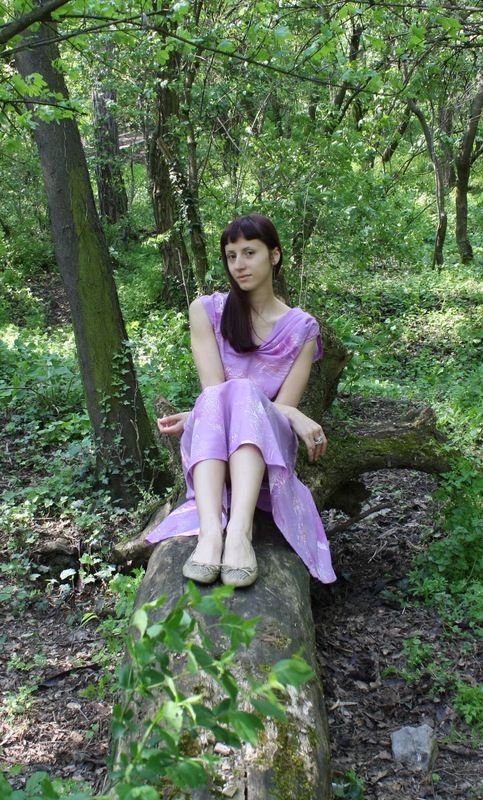 i ended up taking a purple summer dress (yeah i know, purple, what a surprise) for a shoot in the park and i'm keeping it. turns out most of my mom's dresses are quite see through so i had to borrow a slip from her, but i do need to find one of my own. i need to hit the thrift stores in search of one, cause i don't think they make them anymore. or at least not like they used to. So pretty. Can you imagine having a wardrobe filled with custom made clothes, and it be a normal occurrence?! (Well I guess you can because of your mom hahaha). That is just amazing to me.